This stunning cover with sprays of summer flowers - roses, cornflowers and asters. The kit has a large scale black and white chart printed 10 stitches to one inch on two A3 sheets showing one repeat of the design. The pattern is worked in whole cross stitch only using 40 shades of stranded cottons. 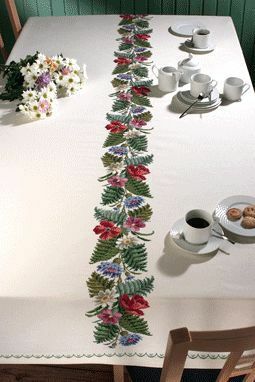 The central panel is worked over 80 by 1040 stitches with an all round border worked in two shades and 6 stitches deep.